The days are getting shorter, and the nights are getting cooler. The kids are trudging off to school again with their backpacks, and leaves are falling from the trees. Yep, it’s official: Fall is here. Now’s the time to finish up any last-minute maintenance projects and get your home and yard ready. 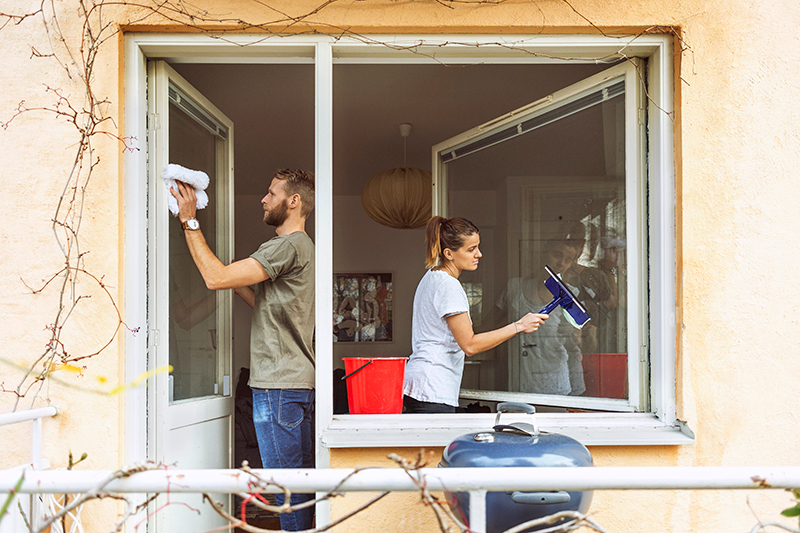 Take care of these 12 tasks to get your home clean, warm and ready for the cool days to come. Depending on where you live, these may be the last weeks this year when it will be warm and sunny enough to repair driveway and sidewalk cracks. No one loves this job, but we all need to do it annually. A few hours of work can prevent big problems later on. While you’re up on that ladder, visually inspect your roof for damaged shingles, flashing or vents. You can also inspect the chimney for any missing mortar and repair it by tuck-pointing, if needed. If you don’t already have compost bins, now’s the time to make or get some. All those accumulated autumn leaves will bring you gardening gold next summer! It may not yet be time to put them away, but go ahead and clean your outdoor furniture and gardening tools so they’re ready for storage over the winter. 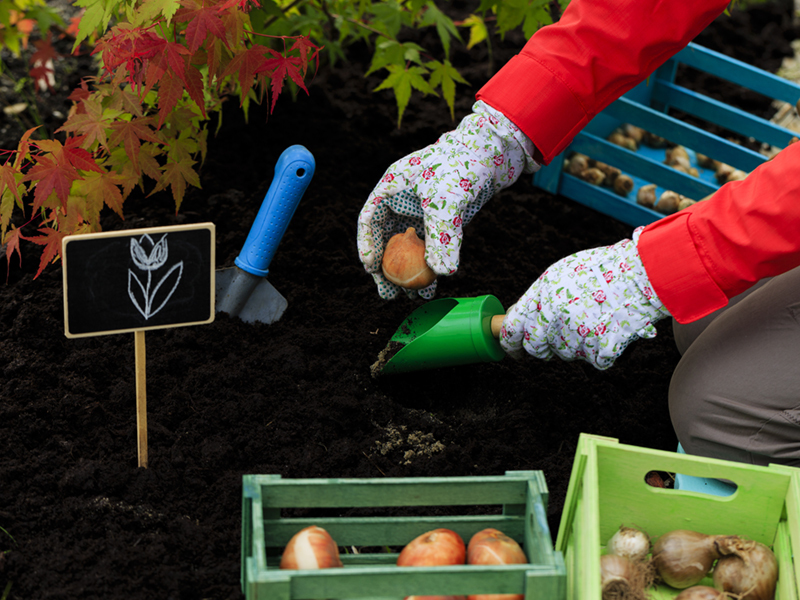 Plant bulbs in October, as soon as the soil has cooled down, to reap big rewards next spring. If you’ve never planted bulbs before, select a spot in your yard that gets full sun during the day. If you didn’t already do it last spring, consider getting your furnace professionally serviced in time for the cold season. At the minimum, though, visually inspect your furnace and replace the furnace filter before turning it on for the first time. Clean out the fireplace, inspect the flue, and ensure the doors and shields are sound. Have the chimney professionally swept if needed. Now’s also the time to stock up on firewood! Inspect your windows and doors. Check weatherstripping by opening a door, placing a piece of paper in the entryway and closing the door. The paper should not slide back and forth easily. If it does, the weather stripping isn’t doing its job. Also, now’s the time to re-caulk around windows and door casings, if needed. Bring as much light into your home as you can for the colder, darker months. To accentuate natural light, clean your windows and blinds, especially in rooms that get a lot of sunlight. Add lighting to darker spaces with new lamps. And consider replacing traditional incandescent light bulbs with energy-efficient bulbs. Even if you don’t have a dedicated mudroom in your home, now’s a good time to think about organizing and stocking an entryway that will serve as a “mudroom” area for cold and wet weather. Put down an indoor-outdoor rug to protect the floor. A fun and rewarding weekend project is to build a wooden shoe rack, coat rack or storage bench for your entryway. Replace the batteries in your smoke alarms and carbon monoxide monitors. A good way to remember to do this is to always replace the batteries when you change the clock for daylight saving time. Create a family fire escape plan, or review the one you already have. Put together an emergency preparedness kit so that you are ready for winter power outages. Once you finish with your autumn home checklist, you will be ready to enjoy the season in your warm, comfortable home.